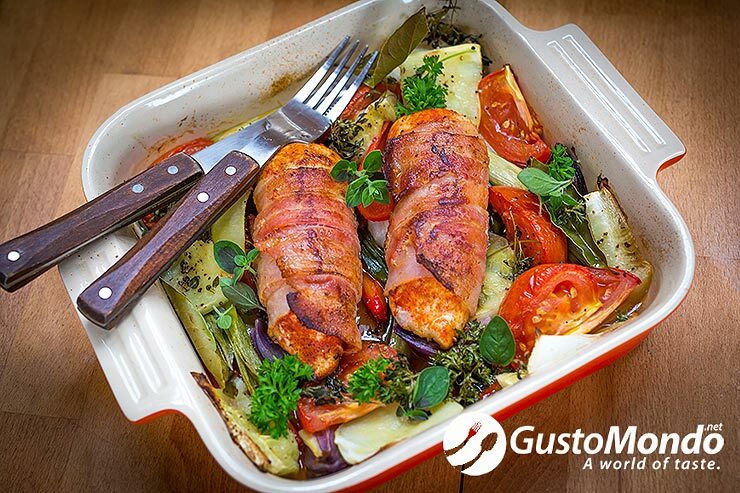 Bacon wrapped chicken breast on a bed of vegetables. Baked. I’d classify this recipe as being healthy. Olive oil, vegetables, lean chicken breast…and a bit of bacon. For flavour and texture. 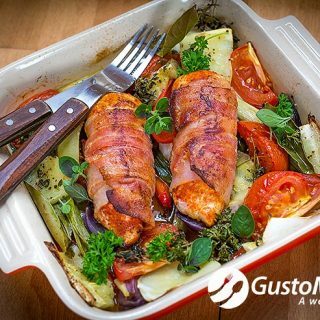 This bacon wrapped chicken dish is also good for those that are on a low carbs, or no carbs at all diet. Yet it’s full of aromas from the herbs, full of vitamins from the vegetables and lean protein. Forget the bacon, a bit of it it’s good for you from time to time. See the short clip below and the equally short description below, and give this a go tonight. Heat up the oven to 180C. Place (randomly) all the vegetables in an oven proof dish. You could add any other vegetables that you like, for example aubergine and celeriac, but I won’t use any carrots, parsnips or turnips as they won’t cook in time. Add the herbs, again use whatever herbs you like, season with salt and pepper and sprinkle with some olive oil over the top. Bake for 25 minutes. Meanwhile season the chicken breast with salt, pepper and smoked paprika. Wrap in bacon. Fry for 2-3 minutes on each side until the bacon is nice and crispy. Place the chicken breast over the half-cooked vegetables and roast again in the oven for further 15 minutes. That’s all there is to this simple recipe. Tasty, healthy and heart-warming any day of the year. Enjoy. Two minutes roasted chicken legs. Vegetable lasagna recipe. No pasta, no bechamel sauce. Baked aubergine with feta cheese and ras el hanout. « Homemade spiced ketchup recipe – no onions. Plus video recipe.